For hundreds of years, North American forests have been providing more than 20 species of hardwoods as the perfect material for flooring, furniture, cabinetry and moulding. The stewards of American forests have Mother Nature to thank for the diversity of trees growing in the temperate climates and regions of the United States. However, for reasons of current fashion, custom or convention, many American hardwood species are unexplored or under-used despite their suitability and commercial availability. Species distribution varies by region and each hardwood species requires a particular set of conditions - specific types of soil and nutrients, and certain amounts of moisture, warmth, sunlight or shade – in which to thrive. That is why American hardwoods typically grow in the Eastern part of the country. More than half of all American Hardwoods are oak, at 52 percent, growing predominately from New England to Mississippi. And to date, eco-inspired designs have utilized hardwoods as a natural, renewable resource well. But American hardwood forests have also provided many other species suitable for cabinetry, flooring, millwork and furniture. Designers and specifiers are unduly limiting their repertoire by overlooking the wealth of hardwood possibilities. 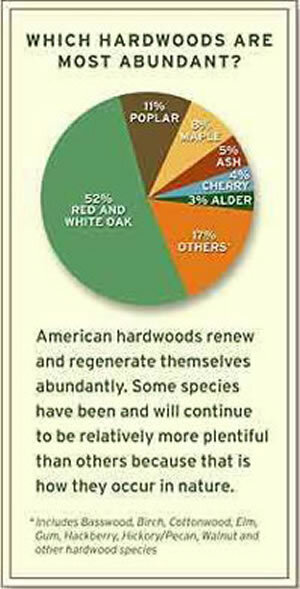 This chart outlines the most abundant American hardwood species available. When you’re planning your next project, think fresh; choose with confidence and consider how you can take advantage of the entire palette of species and make the most of the next generation of American hardwoods.